In the spirit of sharing little parenting tips that I think are handy, I thought I’d pass along another one I recently came by. It certainly won’t take your breath away, but it might just help you get a little more organized, and who isn’t all for that in the new year? 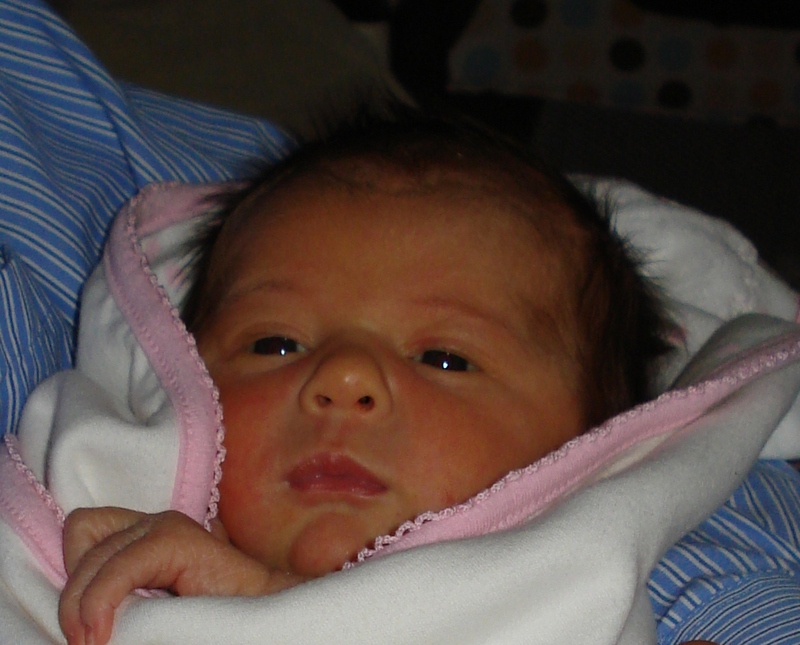 I should preface this tip by noting that my daughter was born with a full head of hair, which though everyone told me she would lose shortly after birth, she never did. See exhibit A. At 21 months, she continues to sport a thick, full head of hair (with gorgeous curls that leave me envious and more than a little curious as to from where they came). See exhibit B.
Needless to say I need to contain her hair via pigtails, ponytail, barrettes or some other assortment of hair accessories. I’ve accumulated quite a collection of such things since her birth, so many so that I often find tiny hair ties in the oddest of places (my laptop bag, the cup holders of my car, the kitchen floor, the dog’s water dish…you get the idea). And since I am so often losing these tiny hair ties, I am finding myself at my favorite place to shop (Target) on a somewhat regular basis to purchase more rubber bands, toddler barrettes and the like. Though I try to keep them contained in a zipped-up cosmetic case, I still find my supply depleted on a regular basis. 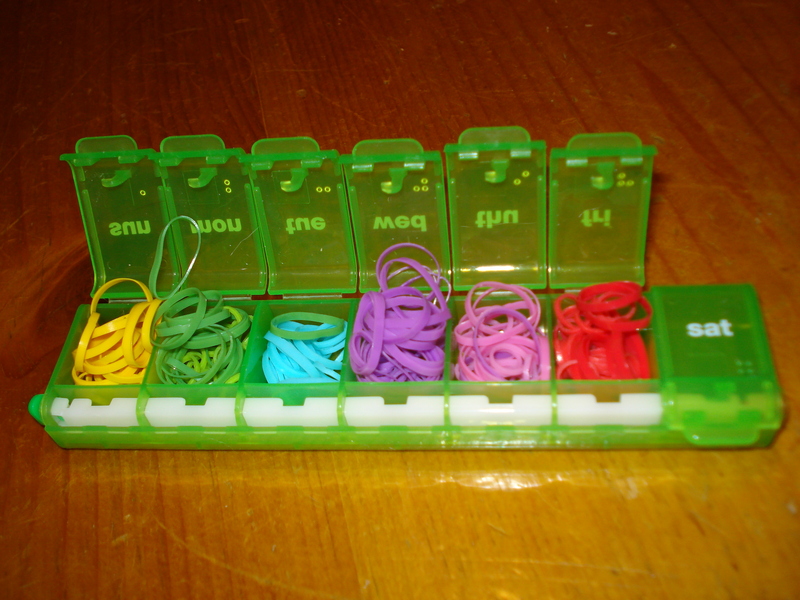 So imagine the “aha” moment I experienced when my sister-in-law whose two daughters have sprouted luxurious locks of their own produced a pill box neatly containing and organizing dozens of hair ties by color. I loved it! And I let her know. She promptly shared that she stole the idea from her own sister-in-law. So I found myself at Target upon our return from our holiday trip to the in-laws’ to find just such a container for my daughter’s many hair ties. And not a day has gone by since then where I haven’t been able to find matching hair ties for my daughter’s pigtails. So simple. So practical. So portable. Thanks for the parenting pearl of the day Jessica! This entry was posted on January 5, 2011 at 5:36 pm and is filed under Baby Girl, Girl Stuff, Mommydom, Parenting Pearls. You can follow any responses to this entry through the RSS 2.0 feed. You can leave a response, or trackback from your own site.